The mannose receptor (MR) has been implicated in the recognition and clearance of microorganisms and serum glycoproteins. Its endocytic function has been studied extensively using macrophages, although it is expressed by a variety of cell types, including dendritic cells (DC). In this study, we investigated its role in Ag presentation by DC using MR−/− mice. 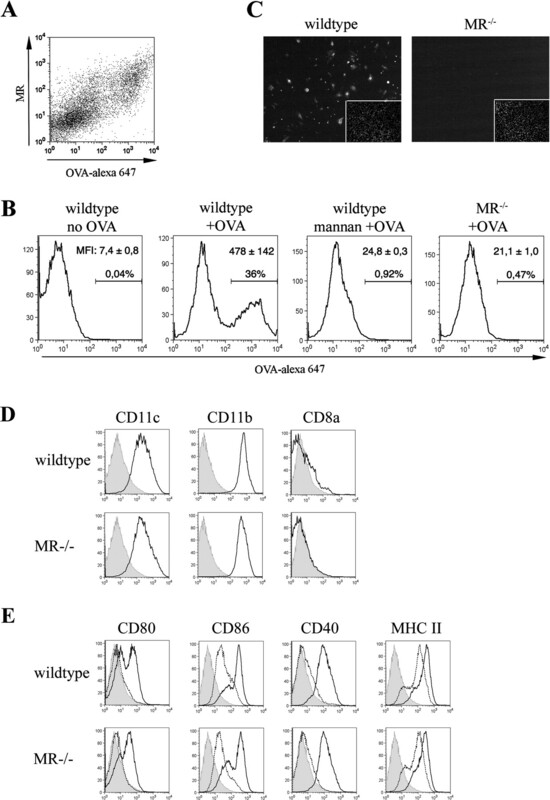 Uptake of the model Ag, soluble OVA, by bone marrow-derived DC and in vitro activation of OVA-specific CD8 T cells (OT-I cells) strictly depended on the MR. In vivo, MR deficiency impaired endocytosis of soluble OVA by DC and concomitant OT-I cell activation. No alterations in the DC subtype composition in MR−/− mice were accountable. Uptake of cell-associated OVA was unaffected by MR deficiency, resulting in unchanged activation of OT-I cells. These findings demonstrate that DC use the MR for endocytosis of a particular Ag type intended for cross-presentation. The mannose receptor (MR)4 is a 180-kDa transmembrane C-type lectin that functions as an endocytic receptor. It has been implicated in the recognition of various microorganisms (1). Furthermore, the MR plays a homeostatic role in the clearance of glycoproteins, such as β-glucuronidase and procollagen, which are up-regulated in the blood serum during inflammation (2). The MR consists of an N-terminal cysteine-rich domain, a fibronectin type II repeat domain, eight carbohydrate recognition domains (CRD), a transmembrane domain, and a short intracellular region (3). The cysteine-rich region mediates binding to sulfated sugar moieties, whereas the CRD bind glycoproteins bearing (for instance) terminal mannose, fucose, and, with a lower affinity, glucose residues (4). Most studies addressing the function of the MR have used macrophages (5), which use it for uptake of mannosylated structures such as dextrans (1). In addition to these cells, the MR has also been detected in liver endothelial cells, dermal microvascular endothelial cells, monocytes, Langerhans cells, and dendritic cells (DC) (6). DC play a central role in the induction of adaptive immune responses (7). After capturing and internalizing Ag in peripheral organs, they migrate toward the draining lymph nodes, where they can activate naive T cells. For activation of CD8+ T cells, captured extracellular Ag are presented on MHC class I molecules (8)—a process termed cross-presentation—which contributes to the induction of cytotoxicity against many viruses and tumors (9). The murine DC subpopulation expressing the CD8α homodimer has been shown to be particularly relevant for cross-presentation of foreign Ag (10) and of self Ag under homeostatic conditions (11, 12). In the presence of inflammatory stimuli, also CD8α-deficient DC were able to cross-present (13, 14). Several receptors mediating Ag uptake in DC have been identified, such as Fc-receptors, DC-SIGN and DEC205. A role of the MR in Ag uptake and presentation by DC has been proposed based on the finding that mannosylated proteins are presented more efficiently than nonmannosylated ones (15, 16). It is unclear, however, whether this uptake was due to the MR, because DC express other receptors, such as DC-SIGN, with affinity for mannosylated proteins (6, 17). For the same reason, mannan, a polymer of mannose, which competitively blocks endocytosis of mannose-rich structures, cannot be considered a specific inhibitor of the MR. To overcome these limitations, we have used MR−/− mice to elucidate the role of the MR in the uptake and presentation of soluble vs cell-associated OVA. MR−/− mice on a C57BL/6 (B6) background were generated and provided by Dr. M. C. Nussenzweig (Rockefeller University, New York, NY) (2). B6 mice bearing the Kb mutant bm1 (bm1 mice) and OT-I Rag-1−/− mice on a B6 background were provided by Dr. W. R. Heath (Walter and Eliza Hall Institute of Medical Research, Melbourne, Australia) (18). For all experiments, mice between 8 and 16 wk of age bred under specific pathogen-free conditions were used in accordance with local animal experimentation guidelines. All mAb used were purchased from BD Biosciences, except anti-MR Ab (Serotec) and SF1, which were purified from hybridoma supernatant (American Type Culture Collection) and used after conjugation with alexa488. All reagents, if not specified otherwise, were obtained from Sigma-Aldrich. BMDC were generated using GM-CSF as described previously (19). At day 7, CD11c+ cells isolated by magnetic separation with the autoMACS system (Miltenyi Biotec) were used for all in vitro experiments. Purity of CD11c+ cells was typically higher than 98%. Soluble OVA was conjugated to a fluorochrome using an alexa647 labeling kit (Invitrogen Life Technologies) according to the manufacturer’s guidelines. The labeling procedure involved gel filtration as a final step for removal of low molecular mass molecules such as unbound fluorochrome. 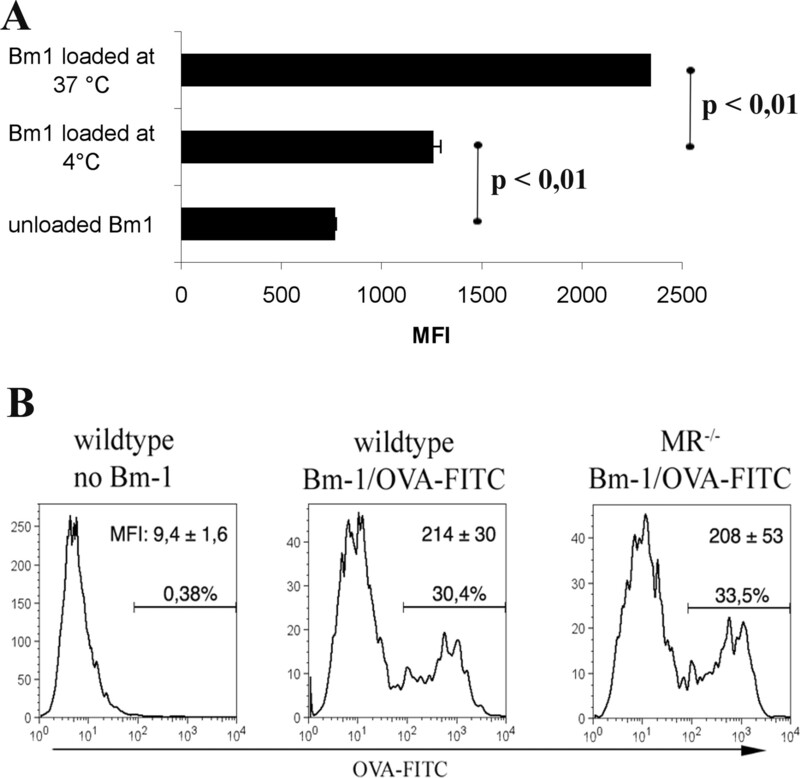 For cell-associated OVA, splenocytes from bm1 mice (2 × 108 cells/ml) were incubated with 10 mg/ml OVA-FITC for 10 min at 37°C, UV-irradiated with 15 mJ for 5 min, and washed extensively. For cell culture experiments, 106 splenocytes were coincubated with 4 × 105 BMDC for 18 h.
OT-I cells were isolated from OT-I rag−/− mice as previously described (18) and further purified by a nanobead-based CD8 T cell isolation kit (Miltenyi Biotec). Purity was typically higher than 96% of viable cells; contaminating CD11c+ cells were typically rarer than 0.2%, NK1.1+ cells rarer than 0.03%, and CD4+ cells below 1%. For presentation of soluble OVA, 4 × 105 BMDC were stimulated with 10 μg/ml LPS for 2 h and incubated with 500 μg/ml OVA or 20 nM SIINFEKL (OVA peptide). After another 3 h, cells were washed, fixed with 0.008% glutaraldehyde for 3 min, and coincubated with 2 × 105 OT-I cells. IL-2 concentrations were determined after 18 h by ELISA. For the analysis of cell-associated Ag, bm1 splenocytes were coated with OVA as described above. Splenocytes (106) were coincubated with 4 × 105 BMDC and 2 × 105 OT-I cells. IL-2 concentrations in the supernatant were determined by ELISA after 40 h.
Cells were isolated from spleen and cutaneous lymph node (cLN) as described before (12). For the preparations from bone marrow, cells were collected by flushing femurs and tibias with PBS. CD11c+ cells from all organs were enriched by magnetic separation using MS25 columns (Miltenyi Biotec). Purity was typically higher than 85%. Flow cytometry was performed on an LSR (BD Biosciences). Dead cells were excluded by Hoechst-33342 dye. Data were analyzed using Flow-Jo software (Tristar), including calculation of division indices, which indicate the average number of cell divisions. Statistical analysis was done using Excel (Microsoft). All experiments reported here have been reproduced at least twice. When we studied uptake of OVA in BMDC, we noticed that only some of the CD11c+ cells took up this model Ag in vitro (Fig. 1⇓, A and B), as others have noted recently (20). We reasoned that this might be explained by selective expression of an endocytic receptor that mediated uptake of OVA. In support of this hypothesis, we observed a close correlation between the uptake of OVA and the extent of MR expression (Fig. 1⇓A). To investigate whether this association was due to a functional role of the MR in Ag uptake, we preincubated the DC with mannan, which competitively inhibits MR-mediated endocytosis (21). This agent blocked the uptake of OVA completely (Fig. 1⇓B). To exclude an influence of other receptors with affinity to mannan, we performed this experiment also with BMDC from MR−/− mice (2). These cells did not show any uptake (Fig. 1⇓, B and C), indicating that the MR was indispensable for endocytosis of soluble OVA by BMDC in vitro. Remarkably, under these experimental conditions, no other receptor appeared to compensate even partially for the absence of the MR. The MR is essential for uptake of soluble OVA by BMDC. A, CD11c+ BMDC generated from B6 mice were incubated with alexa647-conjugated OVA, stained for expression of the MR, and analyzed by flow cytometry. B, CD11c+ BMDC from C57/BL6 mice were treated for 30 min with 3 mg/ml mannan and then cocultured for 10 min at 37°C with 10 μg/ml alexa647-OVA. Histograms show the uptake profiles of fluorescent Ag by mannan-treated and untreated DC, and by BMDC from MR−/− mice. Numbers indicate the MFI ± SD; the proportions of the CD11c+ cells that had taken up Ag are given above the histogram area indicators. C, Immunofluorescence images visualizing uptake of alexa647-OVA by BMDC. D, BMDC were prepared from MR−/− and wild-type mice and stained for expression of the subtype markers CD11c, CD11b, and CD8α (solid lines) or control (gray areas). E, BMDC from MR−/− and wild-type mice were stained for expression of the maturation markers CD80, CD86, CD40, and MHC class II following stimulation for 24 h with 10 μg/ml LPS (solid lines) or no stimulation (dashed lines). To exclude the possibility that BMDC generated from MR−/− mice differed from those from wild-type mice in terms of subtype composition or maturation status, we phenotypically characterized these DC. Consistent with reports from others (22, 23), BMDC expressed CD11b but not CD8α (Fig. 1⇑D). CD11c and CD11b expression was identical in both BMDC populations (Fig. 1⇑D), as was constitutive and LPS-induced expression of costimulatory molecules (Fig. 1⇑E), suggesting equivalent states of maturation. Next, we investigated whether the MR was important also for the uptake of cell-associated OVA, using splenocytes loaded with fluorochrome-labeled OVA (Fig. 2⇓A). To demonstrate intracellular uptake, loading was performed at 4°C and at 37°C, because intracellular uptake is energy-dependent, as opposed to extracellular coating. Indeed, uptake at 37°C was significantly higher than at 4°C, suggesting that some of the Ag was transported into the spleen cells. We then induced apoptosis by UV irradiation and cocultured these cells with BMDC from MR−/− mice or controls. After 18 h, the uptake of cell-associated OVA by wild-type and MR−/− cells was indistinguishable (Fig. 2⇓B), indicating that receptors other than the MR had mediated endocytosis of cell-associated OVA. The MR is dispensable for uptake of cell-associated OVA by BMDC. A, UV-irradiated splenocytes from bm1 mice were incubated for 10 min at 4°C or 37°C with FITC-labeled OVA, and then analyzed for uptake of fluorescent soluble Ag. B, UV-irradiated bm1 splenocytes loaded with FITC-OVA at 37°C were cocultured with BMDC from wild-type or MR−/− mice. After 18 h, DC were analyzed for uptake of fluorescent cell-associated Ag. Apoptotic bm1 splenocytes were excluded from analysis by forward scatter/side scatter gating or gating for Kb+ cells revealed by staining with SF1 Ab. Numbers indicate the MFI ± SD. The proportions of the CD11c+ cells that had taken up Ag are given above the histogram area indicator. The requirement of the MR for OVA uptake suggested a role in Ag presentation. To address this hypothesis, we studied cross-presentation of OVA in coculture experiments with BMDC prepared from B6 or MR−/− donor mice and OVA-specific CD8 T cells isolated from transgenic OT-I mice. Their activation was monitored by measuring IL-2 release into the culture supernatant. This release correlated with the Ag amount in a dose-dependent fashion (Fig. 3⇓A). To ensure that OT-I cell activation was in fact due to cross-presentation, and not to coating of the BMDC with peptide fragments present in the OVA solution, we performed incubation with soluble OVA in the presence of the proteasome inhibitor MG132, which inhibits intracellular generation of peptides for loading onto MHC class I molecules (24). This inhibitor prevented IL-2 release nearly completely (Fig. 3⇓A), indicating that OT-I cells were indeed activated by OVA peptides generated intracellularly. MG132 did not affect OT-I cell activation by BMDC coated with the OVA peptide SIINFEKL, which is recognized by OT-I cells, demonstrating that in this experimental setting, the ability of OT-I cells to produce IL-2 was not compromised (Fig. 3⇓A). The MR is essential for cross-presentation of soluble but not of cell-associated OVA by BMDC to CD8 T cells. A, To establish an in vitro system for CD8 T cell activation by cross-presentation, various concentrations of soluble OVA or of the OVA peptide SIINFEKL were coincubated for 2 h with BMDC from B6 mice in the absence (▪) or presence (□) of the proteasome inhibitor MG132. DC were then washed, fixed, and cocultured with OT-I cells. After 18 h, IL-2 concentrations in the culture supernatants were determined by ELISA. B, BMDC from wild-type (▪) or MR−/− (□) B6 mice were incubated with 1 mg/ml OVA or 200 nM SIINFEKL. After an additional 3 h, cells were fixed and naive OT-I cells were added. IL-2 concentrations in the culture supernatants were determined at 18 h after addition of OT-I cells. C, Splenocytes from bm1 mice were incubated with OVA, UV irradiated, and then cocultured with BMDC from wild-type or MR−/− mice and OT-I cells. After 40 h, IL-2 concentrations were determined. When BMDC from MR−/− mice were used, they induced severely reduced IL-2 production by OT-I cells as compared with wild-type cells (Fig. 3⇑B), demonstrating that MR-mediated uptake of soluble OVA could provide Ag for cross-presentation. 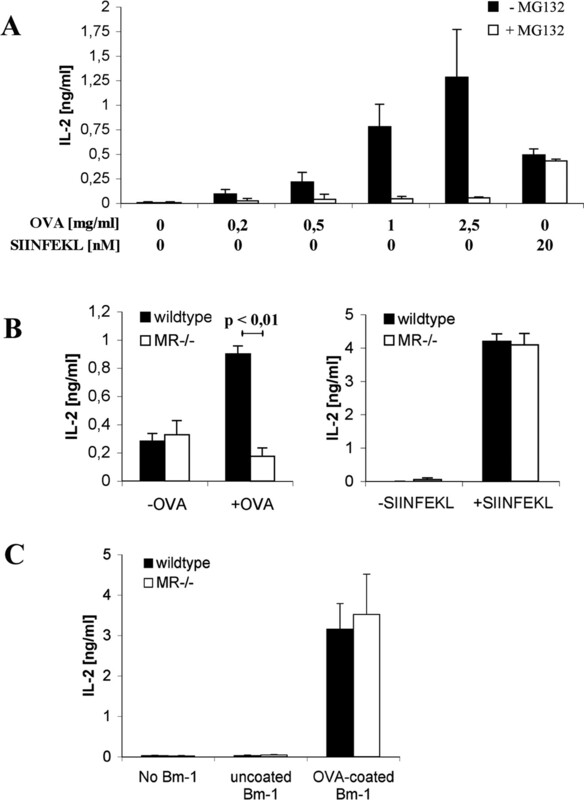 MR-deficient DC externally loaded with SIINFEKL activated OT-I cells equally well as DC from wild-type mice (Fig. 3⇑B), indicating that BMDC from MR−/− mice were not compromised in their general ability to activate T cells. Thus, the MR mediated not only uptake of OVA, but also the resulting activation of OT-I cells. Because the uptake of cell-associated OVA was not reduced in MR-deficient DC, we tested whether OT-I cell activation remained operative as well. To this end, we loaded splenocytes from bm1 mice with OVA. These mice bear a mutant H2-Kb protein that cannot present OVA to OT-I cells (18). After coating with OVA, apoptosis was induced by UV irradiation. These cells were then cocultured with wild-type and MR-deficient BMDC and OT-I cells. No differences in T cell activation between the two DC types could be observed in vitro (Fig. 3⇑C), indicating that the MR not only was dispensable for the uptake but also for intracellular processing of cell-associated OVA for cross-presentation. Next, we decided to investigate the in vivo role of the MR in Ag uptake. To this end, we injected fluorochrome-labeled soluble OVA into B6 mice. Consistent with our in vitro findings, a close correlation between the uptake of soluble OVA and the expression of the MR in DC was found (Fig. 4⇓, A and B). DC from MR−/− mice showed significant but incomplete reduction of uptake of soluble OVA (Fig. 4⇓, C and D). This was most evident in the spleen and in the bone marrow, which have been described as locations in which cross-presentation takes place (8, 25). In the cLN, only moderate uptake was observed, which was further reduced in MR−/− mice, albeit not significantly (Fig. 4⇓, C and D). This reduction was not due to changes of the DC subpopulations present in MR−/− mice, because these were indistinguishable from those in wild-type mice (Fig. 4⇓E). These findings demonstrated that the MR was involved also in the in vivo uptake of soluble OVA, but it was not essential, as opposed to its role in vitro. Indeed, in wild-type mice we found some DC that had taken up OVA but did not express the MR (Fig. 4⇓B). The mechanisms that partially compensated for the absence of the MR in vivo remain to be identified. The MR predominantly mediates in vivo uptake of soluble OVA. A, Gating scheme used for analysis of Ag uptake by splenic DC. B, B6 mice were i.v. injected with alexa647-conjugated OVA (5 μg/g body weight). After 45 min, single-cell suspensions from the spleen were stained for CD11c and MR expression, and analyzed using the gate shown in A. C, Wild-type and MR-deficient C57/BL6 mice were i.v. injected with 5 μg/g body weight alexa647-conjugated OVA. After 45 min, DC were isolated from spleen, bone marrow, and cLN, and analyzed by flow cytometry. Numbers give the proportions of alexa647+ cells ± SD within the viable CD11c+ cells (n = 3 or 4 mice). D, MFI ± SD of the cells from C. E, Alexa647+ splenic CD11c+ cells were stained for expression of the DC subtype markers CD11b and CD8α, and analyzed by flow cytometry. Next, we examined the effect of the MR on the in vivo uptake of cell-associated OVA by injection of UV-irradiated bm1 splenocytes loaded with FITC-labeled OVA into MR−/− mice and controls. DC from the spleen and from the bone marrow of C57/BL6 mice showed significant uptake (Fig. 5⇓, A and B). The cLN showed only marginal uptake of cell-associated Ag, consistent with reports by others (26). In MR−/− mice, uptake was unaltered (Fig. 5⇓, A and B), implying that cell-associated Ag had been internalized by mechanisms other than MR-mediated endocytosis. The MR is dispensable for in vivo uptake of cell-associated OVA. A, FITC-OVA-loaded bm1 cells (20 × 106) were UV-irradiated and injected i.v. into wild-type and MR-deficient B6 mice. After 12 h, DC were isolated from spleen, bone marrow, and cLN, and the proportion of alexa647+ cells in the viable CD11c+ cells was determined (n = 3 or 4 mice). B, MFI ± SD of the cells from A. To assess the in vivo role of the MR for CD8 T cell activation by cross-presentation, we injected CFSE-labeled OT-I transgenic T cells into wild-type or MR-deficient recipient mice. After priming with soluble OVA, we analyzed the proliferation of OT-I cells in spleen, bone marrow, and cLN. In MR−/− mice, proliferation of these T cells was substantially reduced (Fig. 6⇓A). Also, CD69 expression on OT-I cells was substantially diminished on day 1 in all organs tested in MR−/− mice (data not shown), demonstrating that the diminished proliferation of OT-I cells was due to decreased activation at the priming site, rather than to reduced recirculation of OT-I cells activated elsewhere. The MR contributes to in vivo CD8 T cell activation by cross-presentation of soluble but not of cell-associated OVA. A, CFSE-labeled OT-I cells (2 × 106) were injected into wild-type or MR−/− B6 mice. After 18 h, 5 μg OVA/g body weight was injected i.v. After an additional 40 h, the proliferation of OT-I cells was analyzed in the spleen, bone marrow, and cLN. Shown are the CFSE+ CD8+ cells present in the organs. B, Same experimental setup as in A, except that 20 × 106 OVA-loaded, UV-irradiated bm1 splenocytes were used instead of soluble OVA. Numbers give the division index ± SD (n = 3 or 4 mice). Finally, we examined the in vivo role of the MR in the presentation of cell-associated OVA. Wild-type and MR−/− mice were injected with OT-I cells and primed with OVA-coated, UV-irradiated bm1 splenocytes. Proliferation of OT-I cells in the spleen and in the bone marrow was not reduced in MR−/− mice (Fig. 6⇑B). Moreover, no alterations in up-regulation of CD69 in the activated T cells were observed (data not shown). Consistent with the marginal Ag uptake in the cLN, no proliferation of OT-I cells was observed in this location (Fig. 6⇑B). Thus, mechanisms other than MR-mediated Ag uptake were responsible for CD8 T cell activation by cross-presentation of cell-associated Ag. The molecular mechanisms that mediate Ag uptake for cross-presentation are unresolved. The present study is the first to identify a receptor involved in this process, by demonstrating that Ag endocytosed via the MR gained access to the cross-presentation pathway. We showed that the MR was important for the uptake of soluble OVA by DC in vivo, and that it was even essential for BMDC in vitro. Concomitantly, the activation of naive CD8 T cells by soluble OVA was diminished and in fact abrogated when BMDC were used. This was most likely due to reduced cross-presentation of OVA, because the absence of the MR did not affect expression of costimulatory molecules. Furthermore, MR-deficient DC loaded with OVA peptide induced a T cell response equal to that induced by wild-type DC, implying that the costimulatory signals provided must have been similar. Also, differences in the DC subtype composition of MR-deficient mice were unchanged, in particular the content of CD8α+ DC, which have been reported to mediate in vivo cross-presentation of soluble and cell associated OVA (10, 14). As opposed to the clear-cut in vitro situation, uptake and cross-presentation of soluble OVA in vivo was not completely abolished in MR−/− mice, yet it was significantly reduced. This may indicate that BMDC do not mimic all mechanisms involved in Ag uptake by DC in vivo. These mechanisms may involve the generation of OVA peptides by endogenous proteases, or Ag uptake by additional cellular receptors, such as the lectins DC-SIGN and DEC205, whose expression might differ between BMDC and DC in living animals (17, 27). This may be the case for CD8α+ DC that were shown to mediate cross-presentation in vivo (10, 14), because these are known to be absent from BMDC generated by standard methodology (22). Uptake of cell-associated OVA and the resulting activation of OT-I cells were not impaired by the absence of the MR, either in vivo or in vitro. The cell-associated Ag used in the present study was located intracellularly, at least in part. Such Ag may be available for endocytosis by one or several distinct receptors. Reports implicating CD36 in uptake of Ag borne by apoptotic cells are controversial (28). Thus, the mechanisms mediating Ag uptake for classical cross-priming, as described by Bevan (8), remain to be resolved. Nevertheless, our findings demonstrated that additional pathways exist for cross-presentation of Ag carried by microorganisms, or of viral Ag within infected host cells. The MR is mostly known for its role as a scavenger receptor of macrophages. A role in Ag presentation has been proposed by others based on its expression by DC and on its role in the uptake of mannosylated structures such as dextrans or horseradish peroxidase in a mannan-blockable fashion into cellular compartments that contained MHC class II molecules (21). Such uptake could result in stimulation of CD4 T cell clones in vitro (16), suggesting a role for the MR in adaptive immunity. The findings reported here support such a role by demonstrating MR-mediated activation of naive CD8 T cells, and by providing evidence for in vivo relevance of such activation. Furthermore, the use of MR−/− mice in the present study precluded the specificity concerns that apply to mannan blockade of the MR (6). Our findings suggest that targeting of the MR may be useful for introducing extracellular Ag into the MHC class I-restricted Ag presentation pathway. Targeting of a related lectin, DEC205, has been shown to result in tolerogenic CD4 and CD8 T cell activation (27). It will be interesting to investigate whether Ag uptake by the MR would result in immunogenic or tolerogenic CTL priming, or both, depending on the absence or presence of inflammatory stimuli. Finally, the indispensability of the MR for uptake of soluble OVA by BMDC may allow further in vitro dissection of intracellular mechanisms governing cross-presentation. We thank Andreas Kautz and Petra Peters for excellent technical assistance and Dr. Michel C. Nussenzweig for providing MR−/− mice. We acknowledge technical support by the flow cytometry core facility of the Institute of Molecular Medicine and Experimental Immunology and by the central animal facilities of the Medical Faculty of the University of Bonn (House for Experimental Therapy). ↵1 This work was supported by was supported by a junior research group grant from the German state of Nordrhein-Westfalen (to C.K.). S.B. was supported by BONFOR Grant O-173.0009 of the University of Bonn Clinic, Bonn, Germany. ↵2 S.B. and V.L-K. contributed equally to this work. ↵4 Abbreviations used in this paper: MR, mannose receptor; DC, dendritic cell; OT-I cell, OVA-specific CD8 T cell; CRD, carbohydrate recognition domain; bm1 mice, C57BL/6 mice bearing the Kb mutant bm1; BMDC, bone marrow-derived DC; cLN, cutaneous lymph node; MFI, mean fluorescence intensity. McGreal, E. P., J. L. Miller, S. Gordon. 2005. Ligand recognition by antigen-presenting cell C-type lectin receptors. Curr. Opin. Immunol. 17: 18-24. Ezekowitz, R. A., K. Sastry, P. Bailly, A. Warner. 1990. Molecular characterization of the human macrophage mannose receptor: demonstration of multiple carbohydrate recognition-like domains and phagocytosis of yeasts in Cos-1 cells. J. Exp. Med. 172: 1785-1794. Largent, B. L., K. M. Walton, C. A. Hoppe, Y. C. Lee, R. L. Schnaar. 1984. Carbohydrate-specific adhesion of alveolar macrophages to mannose-derivatized surfaces. J. Biol. Chem. 259: 1764-1769. Harris, N., M. Super, M. Rits, G. Chang, R. A. Ezekowitz. 1992. Characterization of the murine macrophage mannose receptor: demonstration that the down-regulation of receptor expression mediated by interferon-γ occurs at the level of transcription. Blood 80: 2363-2373. Figdor, C. G., Y. van Kooyk, G. J. Adema. 2002. C-type lectin receptors on dendritic cells and Langerhans cells. Nat. Rev. Immunol 2: 77-84. Heath, W. R., G. T. Belz, G. M. Behrens, C. M. Smith, S. P. Forehan, I. A. Parish, G. M. Davey, N. S. Wilson, F. R. Carbone, J. A. Villadangos. 2004. Cross-presentation, dendritic cell subsets, and the generation of immunity to cellular antigens. Immunol. Rev. 199: 9-26. Belz, G. T., F. R. Carbone, W. R. Heath. 2002. Cross-presentation of antigens by dendritic cells. Crit. Rev. Immunol. 22: 439-448. Benke, D., T. Krüger, A. Lang, E. E. Hamilton-Williams, C. Kurts. 2006. Inclusion of brefeldin A during dendritic cell isolation allows in vitro detection of cross-presented self antigens. J. Immunol. Methods 310: 12-19.
den Haan, J. M., M. J. Bevan. 2002. Constitutive versus activation-dependent cross-presentation of immune complexes by CD8+ and CD8− dendritic cells in vivo. J. Exp. Med. 196: 817-827. Engering, A. J., M. Cella, D. Fluitsma, M. Brockhaus, E. C. Hoefsmit, A. Lanzavecchia, J. Pieters. 1997. The mannose receptor functions as a high capacity and broad specificity antigen receptor in human dendritic cells. Eur. J. Immunol. 27: 2417-2425. Engering, A., T. B. Geijtenbeek, Y. van Kooyk. 2002. Immune escape through C-type lectins on dendritic cells. Trends Immunol. 23: 480-485. Menges, M., T. Baumeister, S. Rossner, P. Stoitzner, N. Romani, A. Gessner, M. B. Lutz. 2005. IL-4 supports the generation of a dendritic cell subset from murine bone marrow with altered endocytosis capacity. J. Leukocyte Biol. 77: 535-543. Naik, S. H., A. I. Proietto, N. S. Wilson, A. Dakic, P. Schnorrer, M. Fuchsberger, M. H. Lahoud, M. O’Keeffe, Q. X. Shao, W. F. Chen, et al 2005. Cutting edge: generation of splenic CD8+ and CD8− dendritic cell equivalents in Fms-like tyrosine kinase 3 ligand bone marrow cultures. J. Immunol. 174: 6592-6597. Hochrein, H., M. O’Keeffe, H. Wagner. 2002. Human and mouse plasmacytoid dendritic cells. Hum. Immunol. 63: 1103-1110. Imai, J., H. Hasegawa, M. Maruya, S. Koyasu, I. Yahara. 2005. Exogenous antigens are processed through the endoplasmic reticulum-associated degradation (ERAD) in cross-presentation by dendritic cells. Int. Immunol. 17: 45-53. Belz, G. T., D. Vremec, M. Febbraio, L. Corcoran, K. Shortman, F. R. Carbone, W. R. Heath. 2002. CD36 is differentially expressed by CD8+ splenic dendritic cells but is not required for cross-presentation in vivo. J. Immunol. 168: 6066-6070.